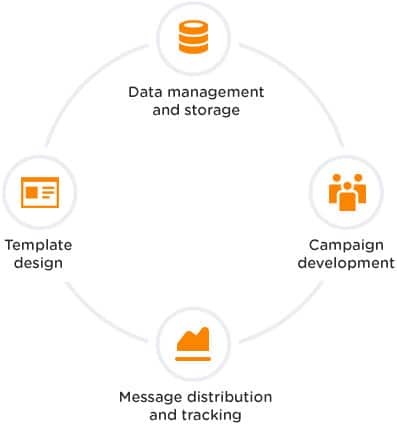 We know how to drive intelligent personalised communication with your customer base, driving increased engagement across multiple channels using your data to produce higher response rates. Struggling to cut through with your message? Direct mail invokes more human senses than any other media, and we know how to leverage direct mail to get greater engagement, increased response rates, and better results. With the rise of digital marketing, letterboxes are less cluttered and ready for your next marketing campaign. Blue Star DIRECT increases your results through the unique personalisation of your direct mail pieces – your copy and images can be tailored to each individual recipient based on your data. This way, your direct mail stands out from the rest of their mail, generating much higher response rates. With literally thousands of campaigns behind us, Blue Star DIRECT knows how to boost your marketing power using personalised and measurable emails. And with mass personalisation available at a low cost, our email marketing virtually guarantees a positive return on investment. You’ll be able to see your campaign’s open and click-through rates in real-time, and manage replies. Additionally, you can integrate email, direct mail and SMS campaigns for even better results. Your customers can redeem their vouchers via scanning, online, or presenting their phone in person. It’s all trackable and accountable, and provides campaign statistics to improve the results of your next mobile campaign. Blue Star DIRECT helps you maximise the combination of physical and digital media to effectively send bills and documents to your customers, via the channel of their choice. We’ll get your billing process up and running faster, in a more cost effective manner and with systems in place to reduce the potential for billing errors. Simply send us the information at any time of the day, and we’ll send off your customised, expertly designed statements and invoices. Your customers get your bills the way they want, improving both time-to-respond as well as increasing response rates, meaning that payments will be received sooner. Complimented by a full suite of tracking capabilities, reporting and ability to view the status of any document at any time, Blue Star DIRECT’s essential mail solutions are a flexible, powerful facility to have in your toolkit.